Islam Around Us: Al-Qaeda affiliate claims attacks against Shi'ites in Baghdad. 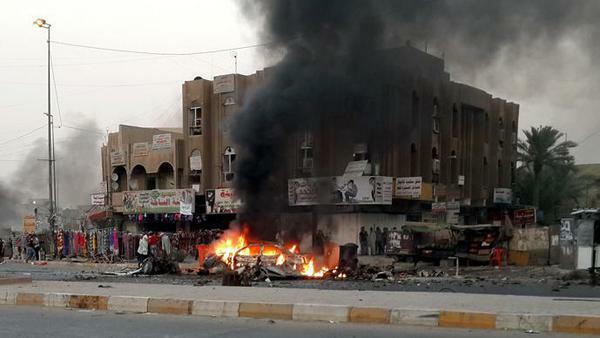 Al-Qaeda affiliate claims attacks against Shi'ites in Baghdad. Baghdad | Retures | 09 Sep 2013 :: An al-Qaeda affiliate has claimed responsibility for a series of car bombs that killed around 60 people in predominantly Shi'ite districts of the Iraqi capital last week. The Islamic State of Iraq and the Levant, which was formed earlier this year through a merger between al-Qaeda's Syrian and Iraqi branches, said it had carried out the attacks in response to the Shi'ite-led government's tightening security Flames rise from a vehicle at the site of a car bomb in Talibiya in Baghdad on September 3, 2013. (AFP)measures. Sunni Islamist groups including al Qaeda, which view Shi'ites as non-believers, have been regaining momentum in Iraq, invigorated by a conflict in neighboring Syria which has brought sectarian tensions across the Middle East to the boil. “The operations encompassed targets that were carefully selected deep within the rejectionist strongholds inside Baghdad,” read a statement posted by the group on militant internet forums, using a derogatory term to refer to Shi'ites. The group said it could now regularly reach the outskirts of the heavily fortified “Green Zone” in Baghdad, where many foreign embassies are located, online monitoring group SITE said. The monthly toll of Iraqis killed in acts of violence has risen at times this year to the highest since the intercommunal bloodletting that peaked in 2006-07, raising concerns of a return to full-blown civil conflict.